The About page found within the Settings app is the one stop shop that gives you all the details about your iPhone, iPad or iPod touch. 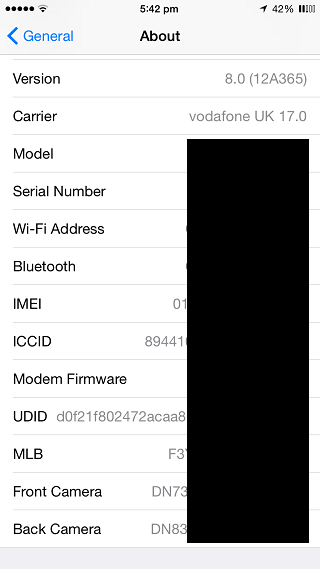 Here you can find all the useful information about your device including its iOS version, serial number, IMEI etc. While this page has most of the stuff you would want to know about your Apple gadget, there are a few things missing from this otherwise complete page. The new AboutMore tweak tries to fix that by bringing that missing information to your About page. After installing AboutMore from Cydia you will new information about your iPhone that includes its UDID number, MLB (manufacturer logic board) serial number as well as separate serial numbers for front and back cameras. While the later ones may not be very useful for you, the UDID number is something you often find yourself looking. The best thing about this tweak is that it adds the extra information in the default About page of iOS, which means you can access it in Settings > General > About. Just like you can access the information that is available by default. You can download the AboutMore on your iOS device from Cydia for free. There are no settings to configure for this tweak.